The description of the shuffle method in Appendix B is incorrect. shuffle modifies the list in place and returns None, not the shuffled list. Other print statements in this session should also have parenthesis. In Listing 12.4 the signature for the _draw method in line 19 should include a parameter to reference a turtle, since the turtle is in fact needed by the child classes. There is a missing space between __main__ and namespace. Then the max function is legal on countlist (as shown on line 11). Recall that the values() method returns a dict_values object which can be turned into a list by applying the list function. Welcome to Python Programming in Context. 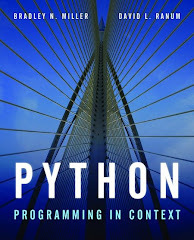 This is the place to find errata and give feedback directly to the authors of the textbook Python Programming in Context. Nothing drives an author more crazy than to find an error in a listing in his own textbook. However, even after months of testing and several rounds of proofreading bugs still find their way in to the final printed book. We aim to provide warnings and fixes here. Please contact us if you find an error that is not covered on this blog.